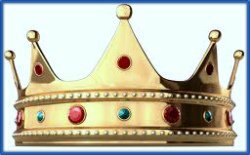 Some call it head and shoulders pattern and others call it king's crown. I have my own name for it. I call it Mt. Everest peak. Whatever the name may be this candlestick pattern is a very significant bearish reversal pattern. In the figure below, consider an uptrend represented by a solid line that passes through points 1, 3, 5. An uptrend swing 1-2-3, 3-4-5, and 4-5-6 is well intact with higher highs at points 2, 4, 6 and higher lows at points 1, 3, 5. Now consider the swing A-B-C. The corrective dip from high point A is well expected as a reaction. But it is also expected for the dip to pause at around the trendline level. Should the uptrend continue, the price should bounce off the trendline and move higher on the north side since the trendline should act as a support. However, the trendline gets violated and the price slides further down to point B. This raises yellow flag of caution that potentially trend reversal is in progress. Next consider the swing B-C. The price bounces off and moves higher from point B to C. At point C the price rendezvous the previous trendline which now becomes the resistance level. For the uptrend to continue the market must shoot higher beyond point C and beyond point A to make new higher high. However, the market fails to make higher move byeond point C. This should be sufficient reason to liquidate all long positions. Finally consider the swing C-D-E. The price slides down after hitting resistance line at point C and dips below to point D resulting in breaking of a neck line represented by the dotted line 5-B-E. 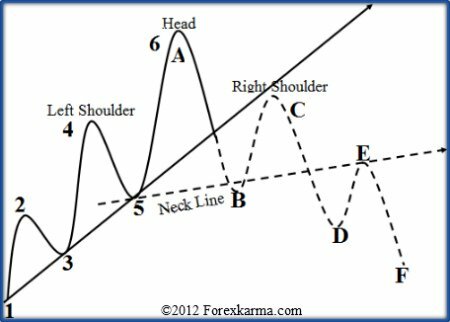 The breaking of the neckline completes the formation of head and shoulders pattern. Usually the price traces an upward return move to point E from point D just to rendezvous the previous neck line which now acts as a resistance line. This point E could potentially become the point to initiate short positions. By the completion of downward swing C-D-E, the price has penetrated the trendline and completed the requirement for down trend with lower lows at point B and D and lower highs at point C and E.
Volume plays a significant role in carving this elegant head and shoulders pattern. Volume reflects direct buying and selling interestes between bulls and bears. Reflecting on the role played by volume in carving the head and shoulders pattern above, volume should increase on the breaking of the neckline along the swing C-D. Next it should decline on the return move along swing D-E. Then finally, it should again expand along swing E-F.